Dublin Airport is the only major European airport not serviced by train services. In the absence of rail services, bus routes connect the airport with the major train stations in Dublin City Centre, namely Connolly Station & Heuston Station. The 747 Route departs from Dublin Airport Terminal 1 and Terminal 2, and connects the airport with a number of popular tourist destinations in Dublin. These include Connolly Station & Heuston Station as well as stops at the Luas Red Line and Busárus (the central bus station). Tickets on the 747 route cost €10 for a return adult ticket and €5.00 for a return child ticket. Single tickets for adults cost €6.00 and €3.00 for children. Tickets can be purchased from vending machines within the airport, or from the Bus & Rail information counter located within the airport. Connolly Station services routes to the North and South of Ireland along the East Coast and Sligo in the North West via InterCity routes. 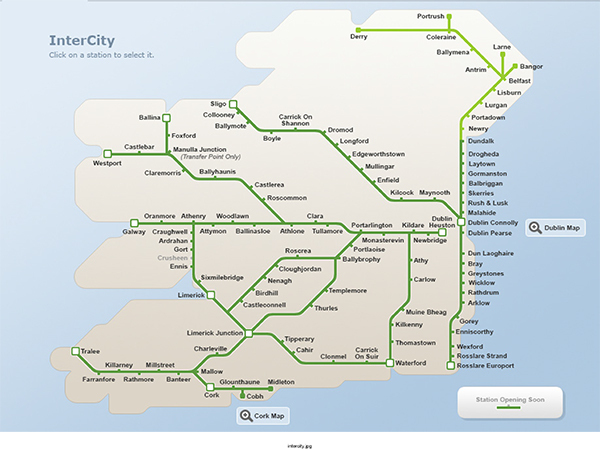 Conolloy Station also service DART routes to North and South city destinations, largely following the coast with Dublin Bay. Heuston Station operates routes to the West & South of Ireland with Galway, Limerick, Waterford and Cork being the largest destinations.